Astra Sharma and Belinda Woolcock defeated Destanee Aiava and Tammi Patterson to secure a main-draw wildcard in the women's doubles at Australian Open 2018. Astra Sharma and Belinda Woolcock couldn’t hide their joy after winning a wildcard into the women’s doubles at the Australian Open, thanks to their defeat of Destanee Aiava and Tammi Patterson in the final of the AO Play-off women’s doubles final on Friday. 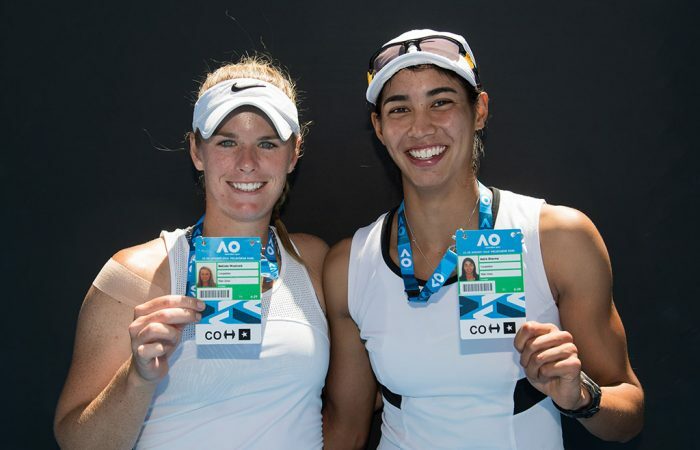 Woolcock and Sharma, both 22, were too strong for Aiava and Patterson, winning 6-1 3-6 [10-3] to earn the right to play in the Australian Open women’s doubles field in January. Sharma, from Perth, will make her debut Grand Slam debut in January – a dream come true. Woolcock, who plays for the Kooyong tennis club in Victoria, said it felt unbelievable when Fed Cup captain Alicia Molik presented the Australian Open accreditation after they won the match. “It didn’t hit me until I had the accreditation around my neck,” Woolcock said. “Astra and I have worked so hard together, we’ve had some tough times during the Australian Open pro series, and we have learnt so much. This week it just came together. After an easy first set, Aiava and Patterson fought back in the second but Woolcock and Sharma maintained their momentum in the deciding tiebreak. “I thought even though we lost the second set I felt like we had most of the momentum during the match and in the tie-break we just kept up our energy, stayed positive and it all just came together,” Woolcock said.